The Excel spreadsheet you have been working with in this chapter — CH4 Charting. 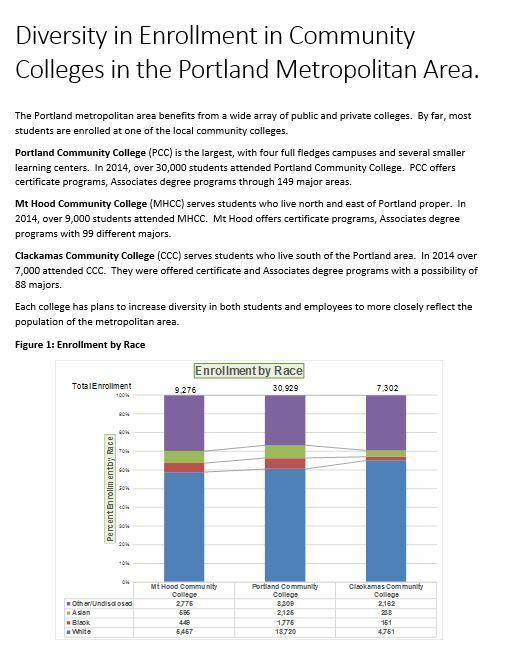 Click below the figure heading in the Word document that reads: Figure 1: Enrollment by Race. The image of the stacked column chart will be placed below this heading. If needed, open the Excel file you have been working with (CH4 Charting). Activate the Enrollment by Race chart in the Enrollment by Race Chart sheet. Go back to the CH4 Diversity in Enrollment in Community Colleges Word document by clicking the file in the taskbar. 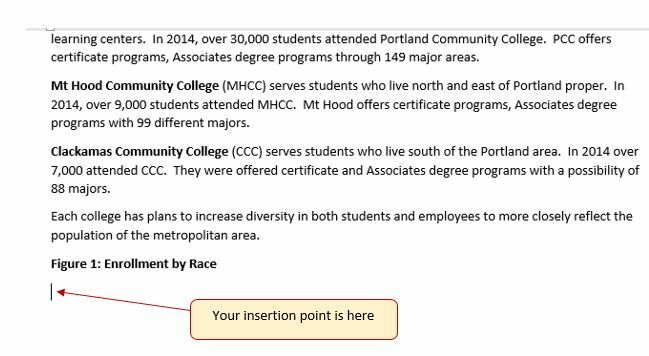 Confirm that the insertion point is below the Figure 1: Enrollment by Race heading (see Figure 4.42) and click the Paste button in the Home tab of the ribbon ( or press Crtl-V). Oh no!! The picture is so big that it falls on to the next page. We will need to change its size. Click the Format tab under the Picture Tools section of the ribbon (see Figure 4.43). To center the chart on the page, make sure the chart is activated. Then go to the Home tab, to the Paragraph group, and select Center. 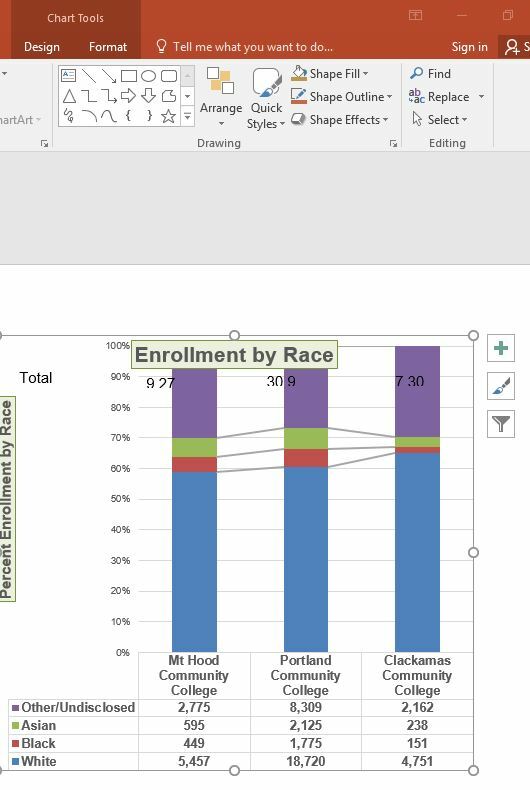 Figure 4.44 shows the final appearance of the Enrollment by Race Source chart pasted into a Word document. It is best to use either the Shape Width or Shape Height buttons to reduce the size of the chart. Using either button automatically reduces the height and width of the chart in proper proportion. If you choose to use the sizing handles to resize the chart, holding the SHIFT key while clicking and dragging on a corner sizing handle will also keep the chart in proper proportion. A PowerPoint data file – CH4 Diversity. Open CH4 Diversity.pptx. Save it as CH4 Diversity in Enrollment in Community Colleges. 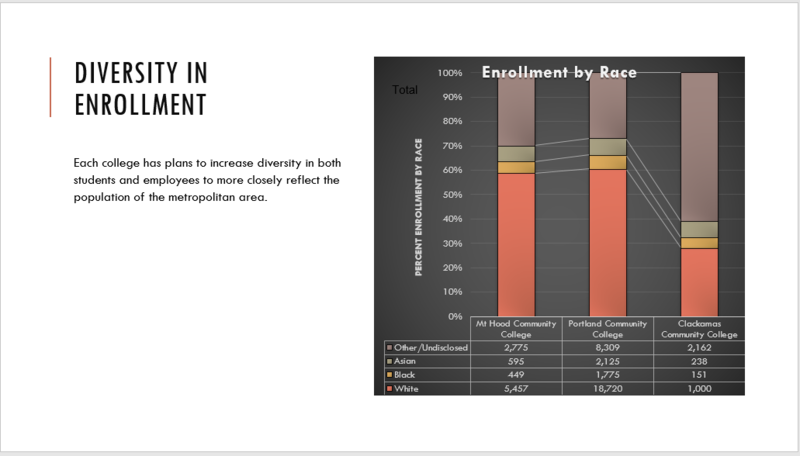 Navigate to Slide 6 – Diversity in Enrollment. This is the slide where you will place the linked chart. Go back to the CH4 Diversity in Enrollment in Community Colleges presenation by clicking the file in the taskbar. Make sure you are still on Slide 6 – Diversity in Enrollment. Click on the outside edge of the empty prompt box on the right. Hover over each of the Paste Options until you find Keep Source Formatting & Link Data (see Figure 4.45). Select this option. This pastes an image of the Excel chart into the PowerPoint slide. In addition, a link is created so that any changes made to the chart (in Excel) appear on the PowerPoint slide. Next we need to make some changes to clean up the chart a bit. First, we are going to apply a different chart style. Click anywhere in the plot area of the column chart pasted into the PowerPoint slide. You will see the same Excel Chart Tools tabs added to the ribbon (see Figure 4.46). On the Design tab, select Style 8 in the Chart Style group. Paste linking this chart caused trouble with the text boxes we added, so next we are going to delete them. Select each text box by clicking on the outside edge of the text box with the four-headed arrow. Press the delete key on your keyboard. Be sure that the insertion point is NOT blinking inside the text box. If it is, you will be editing the contents of the text box instead of deleting the actual text box. The benefit of adding this chart to the presentation as a link is that it will automatically update when you change the data in the linked spreadsheet file. Return to your CH4 Charting Excel file. 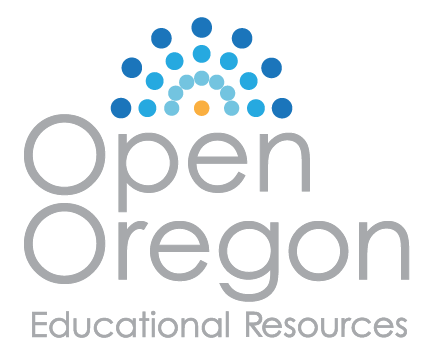 Select the Enrollment Statistics worksheet (the one with the Enrollment data.) Change the value in cell D3 to 1000. You have just changed the number of white students at Clackamas Community College to 1000. This isn’t true, but you want to change the data enough to see the effect in the charts. Select the Enrollment by Race Chart worksheet. Notice how the chart has changed. 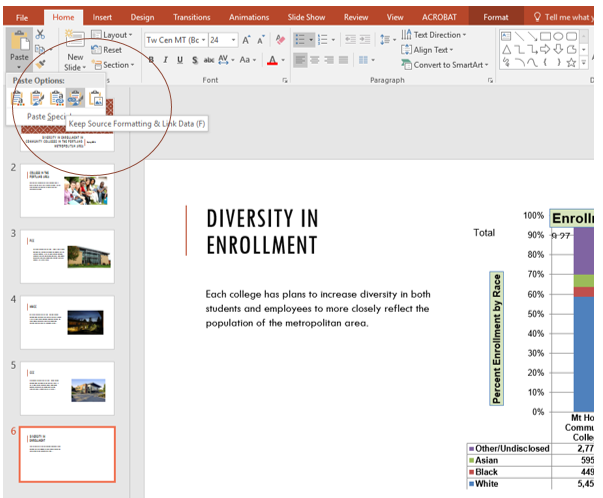 Return to the Diversity in Enrollment in Community Colleges PowerPoint file by clicking the file in the taskbar. On Slide6, you should see the updated chart (see Figure 4.47). If the chart has not changed; be sure that your chart is selected, click the Design tab in the Chart Tools section of the ribbon. Click the Refresh Data button. The change made in the Excel workbook is now reflected on the PowerPoint slide. If that still doesn’t work, you may have created a “normal” link — instead of a Paste Link. Delete the chart and follow the steps again. Start from the beginning of this section. Save your work. You will submit both the Word and PowerPoint files, along with the Excel file, at the end of the next section. Figure 4.47 shows the appearance of the column chart after the change was made in the Enrollment Statistics worksheet in the Excel file. Note that the Data Chart at the bottom reflects the new number, too. The change that was made in the Excel file will appear in the PowerPoint file after clicking the Refresh Data button. Figure 4.47 Styled and Updated Chart. When pasting an image of an Excel chart into a Word document or PowerPoint file, use the Picture option from the Paste drop-down list of options – if you want the image to act as an image. You will not be able to make any changes to the content of the picture. When creating a link to a chart in Word or PowerPoint, you may need to refresh the data if you make any changes in the originating spreadsheet. You should not use the Picture option.